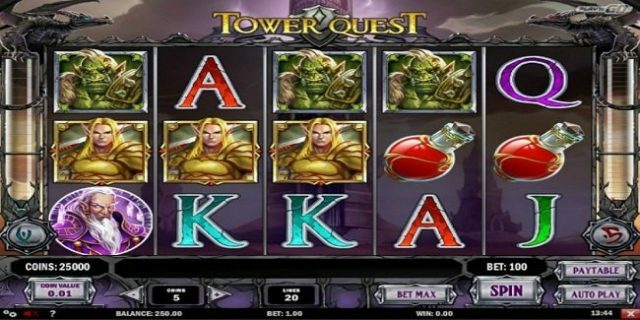 Tower Quest Slot is a video slot game powered by Play’n GO software platform. This is 5 reels and 20 paylines slot game which offers a jackpot of 250 times of your total bet. Return of the player percentage for the game is 96.24. Minimum coins per line are 1, while maximum is 5. You could choose coins size which ranges from 0.01 to 1. Tower Quest Slot features a stacked wild card, the dark tower and2 scatters. There are red bottle blue bottle and a bonus icon also exist in the game. You can play Tower Quest Slot at any of the Play’n Go casinos. There are five basic options available in the game and they are “Coin value”, “Coins”, “Spin”, “Bet Max” and “Auto Play Option”. Coin Value is used to regulate the coin value, coins is used to Adjust the number of coins wagered, spin button is used to Start the game, Bet max button is used to Choose the maximum bet which is 1 and “Auto Play” option is used to Spin the reels a number of times without being interrupted. Players can receive bottles in the main game to activate bonus rounds. The more bottles players collect, the more round of bonus is activated in players account. 10 Red Bottles will trigger first free spin feature. 20 red Bottles will activate second free sin feature and 30 bottles will activate third round f free spin feature.